The hardware and manufacturing costs of the Kindle Fire may exceed the device’s retail price, but Amazon is not losing any money on it. 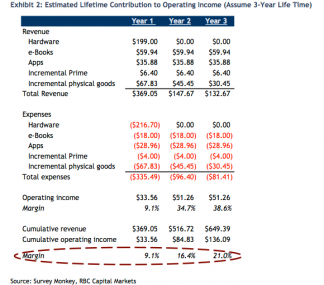 Every Kindle sold is another annuity revenue stream for the company, strengthening its core retail business. 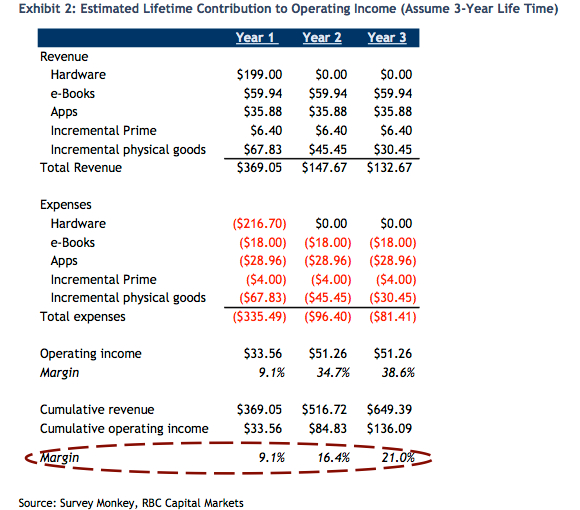 And according to RBC, that revenue stream is larger than you might expect. 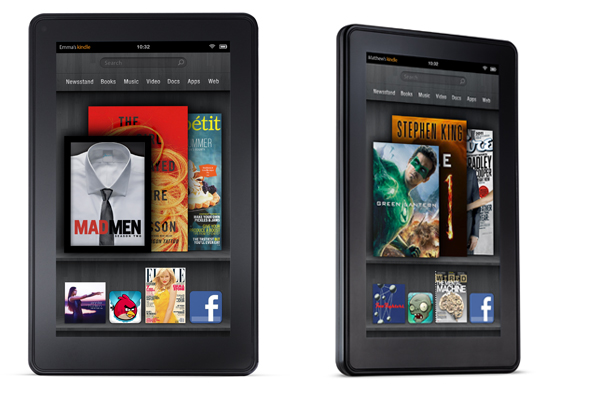 A new survey by the investment banking firm concluded that each Kindle Fire generates well over $100 in additional income, which more than makes up for the $2 to $3 Amazon reportedly loses on each sale. So: an additional $136 over the lifetime of the device. How are Fire owners spending that money? Mostly on e-books. According to Sandler’s survey, 80 percent of Fire owners have purchased e-books, and 58 percent of those bought more than three of them within the first 60 days of ownership. Sandler figures that means the typical Fire owner will buy five e-books per quarter, generating about $15 net per quarter for Amazon (assuming an e-book ASP of $10). Making up the remainder of that $136 sum? Apps, mostly. Two-thirds of the Fire owners Sandler surveyed had purchased at least one app. And 41 percent of those claimed to have purchased three or more. 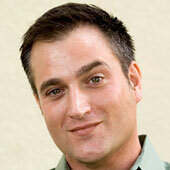 Sandler estimates that the typical Fire owner will purchase three apps per quarter, generating another $9 for Amazon. Add to that video-on-demand buys and incremental purchases of physical goods, and you reach $136. Which isn’t bad at all, particularly if you’re multiplying it by the three million to four million Fires that Sandler expects Amazon to sell in its fourth quarter.